Operation Farm are really excited to be able to run our Abundance Tameside project for a third year. We are looking for volunteers to help harvest trees (with recruits taking home a share of the fruit) and for suggestions of trees in gardens or parks with uncollected fruit that could be harvested. All sessions are suitable for all ages and are lots of fun. This year we will be harvesting around the borough on the following dates and anyone is welcome to join us. We start at 10am and pick for a couple of hours – details of where we will meet and pick will be published on Facebook before the date or call for details. No experience is necessary and new volunteers are most welcome. More dates may be added as more trees are reported! 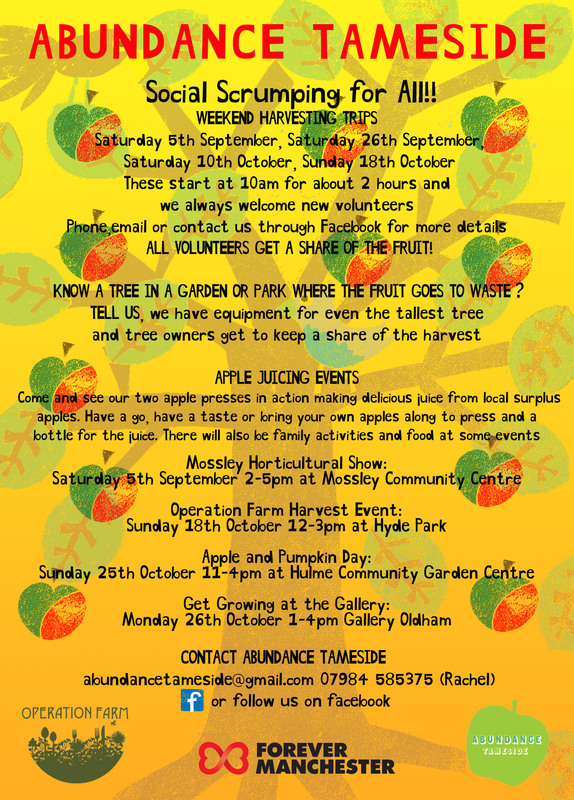 As well as the volunteer sessions the project will be promoted at the following events with our two apple presses in action, juice tasting and with our ever popular ‘Human Fruit Machine’ making an appearance! We are also encouraging people to bring their own fruit along to press and take home – remember to bring some clean plastic bottles too! ← SUMMER FRUIT TREE PRUNING WORKSHOP – NOW FULLY BOOKED!